As well as offering a reliable and stable form of educating our children, most schools now offer a plethora of after school activities. 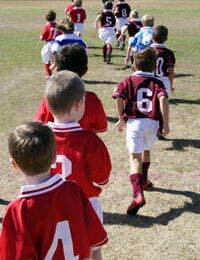 Schools offer after school activities such as sports club (swimming, football, netball, etc.) ITC (Information Technology) classes, book clubs, art clubs, drama and music. These are just some of the activities that may be on offer at your chosen school. Many schools now operate after school activities with the assistance of their Parent Teachers Associations and parents themselves can participate and offer support and assistance while these activities take place. Extra curricular activities offer children fun and beneficial activities away from the classroom. As well as being fun for the children they also teach them valuable life skills. Skills that may be gained from attending sports clubs include; leadership skills, working within a team and communication skills, where as children will develop their creativity from clubs such as art, and confidence from clubs such as drama. It is important also to consider the social implications of these after school clubs. Whereas many children may not interact outside the confines of their school because of distance etc the after school club gives them the opportunity to interact with their fellow students in a different way. While on the whole these activities are funded by the schools themselves – with additional funding if available from the Local Education Authority – parents are encouraged to donate some of their time should they be in a position to do so. Some parents may be able to offer transport home for other children. Most teachers of course are happy to be involved in such activities and see this as an acceptable and advantageous way in which to get to know their pupils better and indeed many after school clubs are seen as a means to break down the pupil-teacher divide. After school clubs can also help alleviate the pressure on parents who cannot collect their children from school at the end of the school day due to work commitments. Overall though these after school clubs and the activities they run are used a means of stimulating our children’s minds and imaginations and also as a way of increasing their capacity for learning and the understanding of those around them. Bringing education and social interaction together in the form of a subject that is not normally taught during the school day is a valuable and worth while means of ensuring that every parent’s child grows and flourishes in an environment that is both safe and secure whilst being informative at the same time.